If you require meeting rooms in Rugby and are looking for a conference venue that will really impress your delegates, look no further than our beautiful boutique hotel, located within a few miles of the M6, M1, A14 and A5 near Rugby. Our conference facilities are well-equipped, comfortable and peaceful, with plentiful natural daylight, ground floor, wheelchair accessible locations, free parking and all the essential ingredients you need for a busy and productive day. The Old Library is perfect for a boardroom style meeting for up to 14 people, or for smaller groups, interviewing and one-to-ones. It is also a popular choice for private dining in the evening, for those attending residential meetings. The Garden Room is a beautiful, light meeting room, which can seat up to 70 people, theatre style. 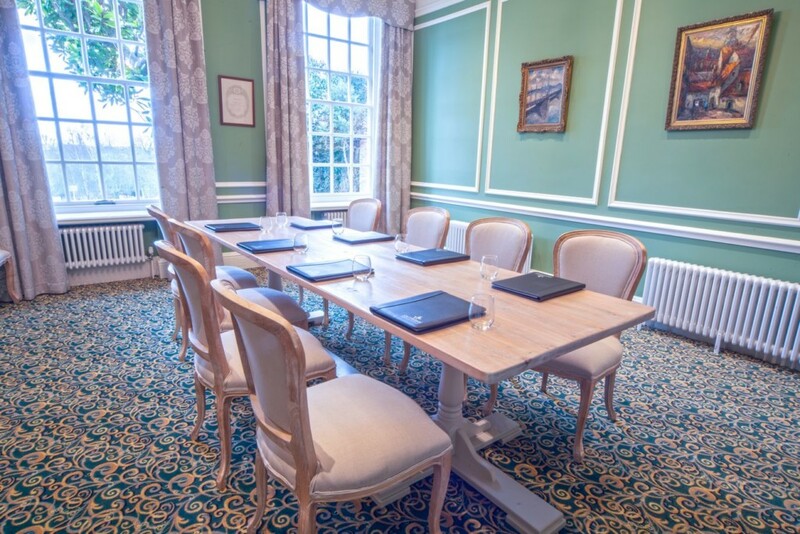 This popular meeting room opens directly into the gardens so is ideal for long meetings and residential meetings, where delegates may want to stretch their legs at regular intervals. 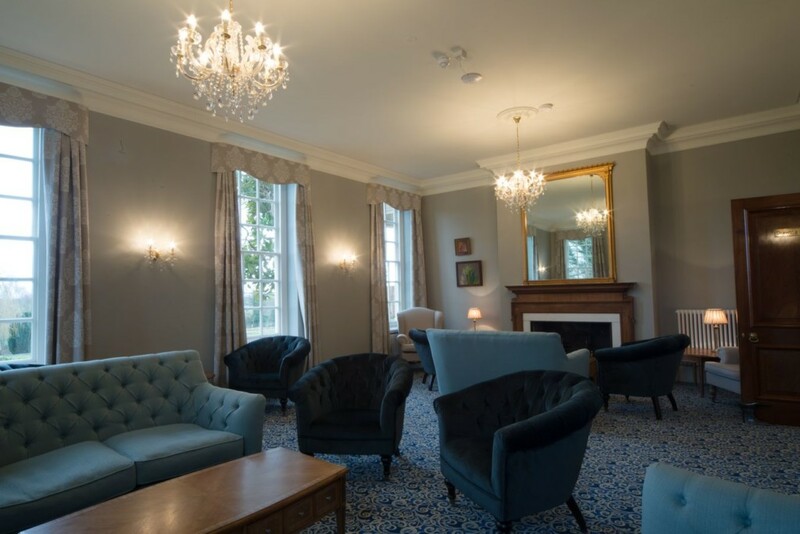 The Drawing Room is the hotel’s lounge area, where guests are welcome to enjoy refreshments from our coffee menu or refuel with a light-bite, whilst using the WiFi. The Drawing Room cannot be hired on a private basis. Please enquire about The Old Library for small private meetings. The Old Hall is part of our Banqueting Suite building and is accessed via a large private bar area. This spacious meeting room is available for conferences of up to 165 delegates, seated theatre-style and can be used for corporate events, in conjunction with the bar and Swedish Room, for large meetings and conferences of up to 250 people. The Swedish Room is the largest of the meeting rooms in our Banqueting Suite and can accommodate up to 250 people seated theatre style. This room is commonly hired together with The Old Hall and bar to give private use of the whole Banqueting Suite building – perfect for large meetings and conferences. Located in the centre of the UK, near Rugby, within 5 miles of the M6 (junction 1), M1 (junction 18), A14 & A5 and a few miles from Rugby Train Station. A flexible approach. As a privately owned hotel Catthorpe Manor Estate can provide you with a level of flexibility and personal service unmatched by most large chain hotels. Plentiful, free on-site car parking. Fast, reliable and complimentary WiFi throughout. Fresh, high-quality, locally sourced food and refreshments and excellent customer service. 20 beautiful en suite bedrooms and on-site restaurant. Extensive grounds, ideal for team building activities. Room Hire Only, Day Delegate Rates, 24HR+ Rates & Bespoke Proposals Available.